The European Parliament is the direct elected body in the European Union. It therefore represents the 500 million citizens of Europe, including you. The Parliament acts as a co-legislator, sharing with the Council the power to adopt and amend legislative proposals and to decide on the EU budget. It also supervises the work of the Commission and other EU bodies and cooperates with national parliaments of EU countries to get their input. The European Commission has the legislative initiative, but under the Treaty of Maastricht, enhanced by the Lisbon Treaty, the Parliament has a right to ask the Commission to submit a proposal on a certain policy level. Until 1979 the members of the Parliament were drawn from national parliaments, but since then they are directly elected for a period of five years. Each member state has the freedom to organise these elections in any way they want, if they guarantee equality of the sexes and a secret ballot. The division in seats after the actual vote is based on proportional representation. The political fractions in the European Parliament, the fractions where the politicians on whom the votes are casted will take place, are not based on nationality or home country but rather on political preferences. For example, the European People’s Party is a fraction which is made of the Christian Democrats politicians from all over the member states. The same goes for the Socialist Party, the Group of Progressive Alliance of Socialists in the European Parliament and the Europe of Nations and Freedom Group. As stated, this are not political parties as we know them from our national governments, but can be best described as an alliance or group with common political interests instead of a party with one clear vision on politics. The name party here is somewhat confusing, but as you can see the name party, group and alliance all say the same: a fraction of politicians with common political interests. The head of the European Parliament is currently Martin Schultz, elected for two and a half years, half the lifetime of a Parliament. The President represents the Parliament in the outside world and in all the other European Institutions, and he or she makes sure that the procedures and rules are followed correctly. All legislative acts and budgets accepted by the Parliament must be signed by the President in order to make them operational. 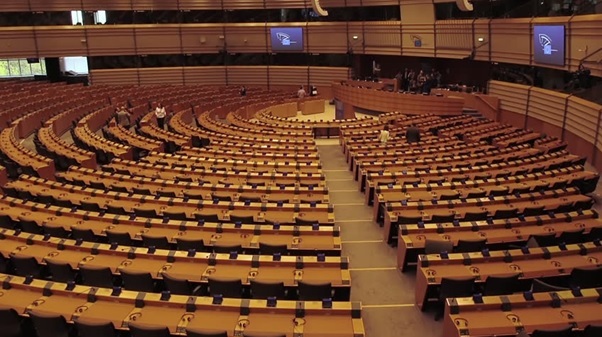 The European Parliament meets in the Plenary Hall in Brussels, see picture left, and in Strasbourg. This seems impractical, but has a political cause: Charles de Gaulle, the former president of France, was only willing to join the Union if the European Parliament was partly seated in his country. Strasbourg it was, and therefore once in every two weeks the whole Parliament, staff, translators and members of European Parliament will travel from Brussels to Strasbourg or back.